Although the terms "essential oil" and "extract" are sometimes used interchangeably, they technically have different meanings. Certified aromatherapist Katharine Annett, R.N., explains, "extracts are for cooking and are not as potent. Essential oils are the essence of the plant and are medicinal; extracts are not." Rosemary is one such plant that is used both as an extract and as an essential oil. An Austrian study published in the September 2010 issue of the journal "Scientia Pharmaceutica" investigated the different forms of rosemary. Researchers from the Institute of Pharmaceutical Sciences, University of Graz, discovered that rosemary extract contains different amounts and types of components than rosemary essential oil. The study found that rosemary extract contained much less oil from the plant than the essential oil. The recommended dose of rosemary essential oil equaled 190 to 380 mg, whereas rosemary extract only contained 6.39 to 6.57 mg of essential oil per recommended dose. 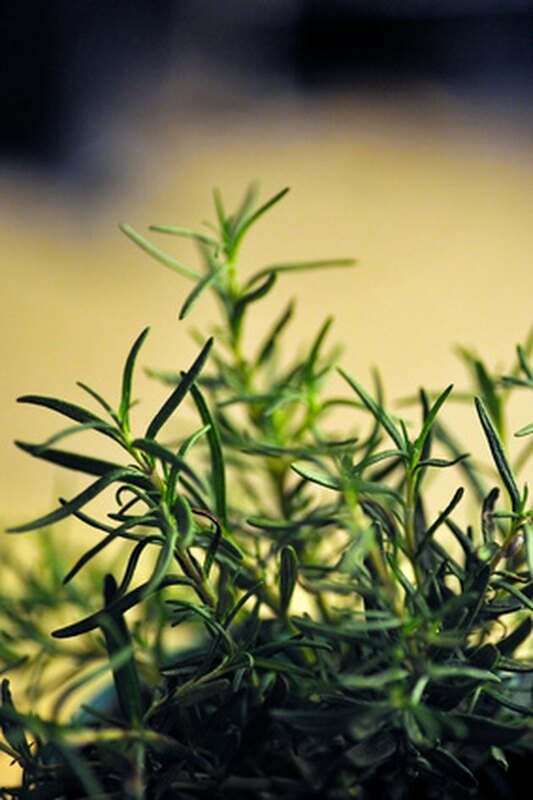 Rosemary provides your body with antioxidants when ingested, as in the case of rosemary extract. Antioxidants fight free radicals, which many experts believe are responsible for cancer and other diseases. The article in "Scientia Pharmaceutica" explains that the extract is used in herbal medicine, although science has not sufficiently studied it for this use. Some uses include relieving headaches, respiratory sicknesses and upset stomachs, as well as being added to ointment for skin infections, sores and insect bites. Otherwise, it is used in food. Rosemary essential oil has antimicrobial properties, fighting Staphylococcus aureus, Candida albicans, Pseudomonas aeruginosa and Escherichia coli. Rosemary essential oil is used for a variety of skin problems, including acne, infections and eczema. Annett explains that you can add rosemary to your shampoo if you are a brunette, as it "acts like a dye for dark hair." She notes that it is also used to stimulate memory and uplift your mood when inhaled. It is used for respiratory sicknesses and to soothe sore muscles and arthritis when added to a bath or massage oil. More research is needed to back up these claims. While you can ingest rosemary extract, there is a risk of allergic reaction. Also, taking more than recommended doses of the extract can cause fluid in your lungs, miscarriage, vomiting, spasms and coma. Avoid rosemary if you have ulcers, ulcerative colitis, Crohn's disease, high blood pressure or are breastfeeding. Talk to your doctor if you are taking medications, as it can interfere with some. As for rosemary essential oil, ingesting it can be toxic. Generally, you should not ingest any essential oils, unless under the direction of a certified aromatherapist or other qualified health practitioner. Can Turmeric Benefit the Hair?